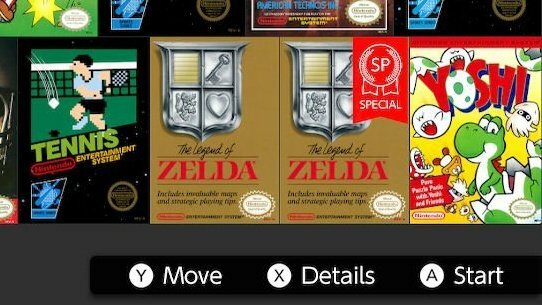 If you're a subscriber of the recently launched Nintendo Switch Online service, and especially if you're a fan of the instant-access NES catalogue now available to you, you may well be aware that today sees the release of three new games. Well, it turns out there's actually a fourth - and it's a spin on a Zelda classic. Yes, as promised, Solomon’s Key, NES Open Tournament Golf and Super Dodge Ball have all arrived, bumping the standard roster of NES games up to 23 in total, but this new Zelda option takes that total up another notch. 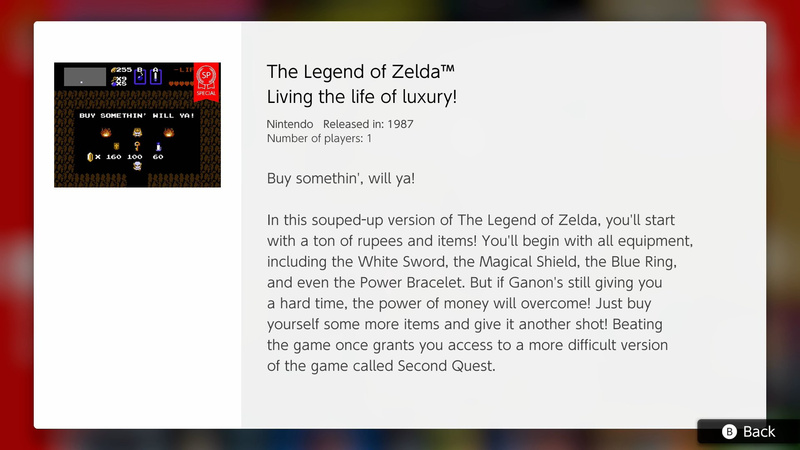 Called 'The Legend of Zelda – Living the life of luxury! 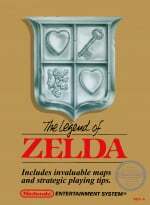 ', the game acts as a "souped-up version of The Legend of Zelda", giving players access to pretty much everything from the start. Take a look. As you can see, players start with all equipment and lots of rupees and items, making the adventure a whole lot easier and much, much quicker, we'd imagine. Interestingly, beating the game in this way will unlock a "more difficult version" called Second Quest. Whether this is more in line with the normal adventure, or still plays like this new 'Luxury' style, is yet to be seen. It's certainly interesting to see Nintendo release a copy of the game like this - it essentially appears to behave like a cheat code giving you access to unlimited items from the start - but we're sure many will dive in to see how it plays. Will you be giving this one a go? Do you think more classic games should come with easier variants such as this one? Let us know your thoughts in the comments below. I haven't even beaten the normal version of this game yet! A gem I haven't had the time to try out. This is not really a surprise, because it was already known it was coming. More NES games will be getting this treatment in the upcoming months. I thought looking for the items was the point of the game, even if it can be frustrating at first. The difficulty is not adapted to today's audience so that's a way to explore it for most without suffering. I had played the original Zelda, it was really difficult. This one, I am not sure if I want to play it. That's cool for speed-runners and retro gamers in general. Reminds me of the NES Remix mini-games. I play nes games for the difficulty. But it's a nice little bonus. "The Power of Money will overcome!" That sounds a lot like micro transactions. I beat it on the NES Mini, but never tried Second Quest (I was going to at some point). Now with this I could beat the First Quest much more easily in order to get to the Second Quest fast, if I wanted to play it on the go. If not, I have the save data on my NES Mini to continue were I left. Good news! I hope they give other nes classics (and other consoles eventually?) this treatment. Maybe new layouts for maps or upgrades for Metroid? That's pretty cool, but I think it would take all of the fun out of the game for me, once you get used to the game it really is not that difficult. Interesting. I just wanna say it’s frustrating that we’re only getting monthly additions to this library, especially when it’s only 3-4 (could easily add 3 a week) but I guess surprises like this are a welcome bonus. Also I wish they had electronic manuals on this. @Vapeguy Good to know, thanks! So it's just a lazy romhack to appease a generation of gamers that won't persevere a tougher NES game. I mean true, it's not like you had one game to buy and once you had it you had to make the most of it, these days we're completely spoilt for choice. @Yasume really, I have not heard anything on that. Which other games are known to receive similar features? Already beaten both quests last month when the service launched, but I guess I can do both again in this remixed mode just for fun. I wouldn't mind seeing some more ROMhack type stuff made available, maybe a remixed Metroid with items moved around or an "official" randomiser. EDIT: Got up to the fifth dungeon and turned it off. This is not even a ROMhack, it's simply the same ROM as already exists but it begins immediately from a custom save-state (no title screen or anything), complete with sword beam mid-destruction on the bottom screen, and many screens on the overworld with all-but-one enemy killed (a useful trick to avoid enemy encounters, as enemies do not respawn until every enemy on the screen has been killed). If Nintendo ever does a "SP" version of Metroid, expect it to simply be a custom save state with "JUSTIN BAILEY" entered at the password screen. It's the most lazy way Nintendo could have done this "special version", and boy have they delivered. This entire service reeks of the lowest effort, bare minimum. What's most interesting to me is that the game is designed such that you can actually have all the weapons and items right at the start and it doesn't break the game. Most modern games would die a death if you tried to do anything other than what the developers have dictated you specifically have to do at any and every given point. Meh. I was hoping it would be "souped up" with the original Famicom Disk System music. Now that would be special. @Medic_alert Dunno. If I had a Switch, this might be the thing that would finally get me to bother trying to get past the few screens of this game. I've always found it just too frustratingly hard early on to bother going any further in such an old game. This could change that, if I can play without dying every few seconds. Thats boring, give us Other options instead! @impurekind it really isn't that hard. You can run to the first dungeon without getting hit pretty easily and with the save state option it is really easy. Hey cool, why not, it'll never be enough to please some people but I like it. I can appreciate Nintendo adding easy modes in some of their games like with DCK and Super Mario. But you should be able to choose the normal game too, is that not already part of the deal? I'm assuming it is. Either way, it makes you wonder if they might explore making new maps for older sprite based games. 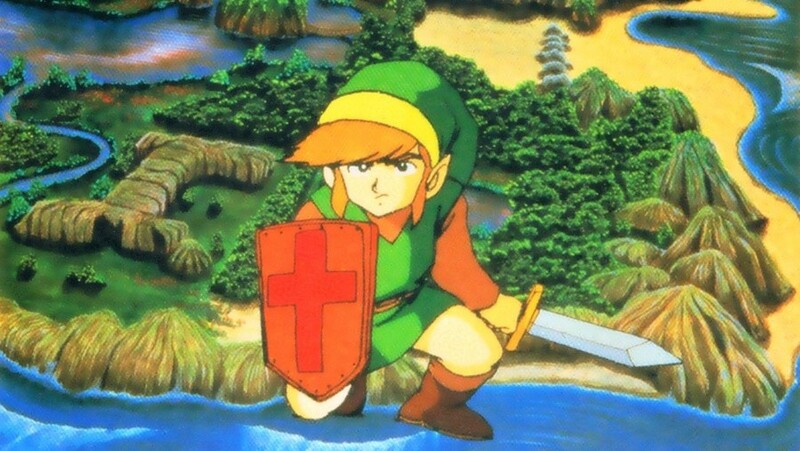 People would kill for a new map/world/story for Link to the Past. "Interestingly, beating the game in this way will unlock a "more difficult version" called Second Quest." Didn't the original feature this, too? @Nukuleardawg I actually did, briefly. But my news feed was immediately flooded with a billion Japanese posts that I can't read, and it drove me crazy so I removed the account. So ended my foray into region-free gaming. Still... I'd like to have the localized game with Japanese music. Shouldn't be too hard to stitch that together, right Nintendo? Yeah, but have they finally included the map that came with every NES/Famicom version of the game, which showed the location of all the dungeons and the order of the first 4 (thus isn't quite as "open world" as people think)? They never seem to include this with the digital manual whenever they've ported it to various things and it always makes people think that the game is incredibly obscure and confusing, when this actually wasn't necessarily the case (at least not to that extent). @Balta666 I saw a list of them on Gamefaqs a couple weeks back, but I can’t find it anymore. I remember seeing The Legend of Zelda, Super Mario Bros. and Super Mario Bros. 3 on it. Iirc there was one more, I want to say either Dr. Mario or Metroid, but don’t quote me on it. @Moroboshi876 if you want a quick way to get to Second Quest all you have to do is name Link “Zelda” he will be holding the White Sword to prove it worked. @Medic_alert I never had the NES, my first Zelda was Links Awakening. I only found this out for the GameCube port one of the magazines (Cube) had the code and the map in it. The Legend Of Zelda: Check Your Privilege Edition. I think we will see some more nice additions in the future! @Sveakungen Yeah, like Super Mario Brothers where you start at the end & just have to walk to Peach & then the game ends. Well, this defeats the purpose of the entire game. I wish they'd just stop with this kind of stuff for now and dump more ROMs into NESflix at a rate faster than this. Really build up the library first, then do stuff like this. That's one thing I asked for from this service. Hopefully we'll get other surprises in other ways going forward, like random days where games just pop in unannounced. More surprises, Nintendo. Fan service, even on the smallest level, should be embraced. This was completely unexpected, and I will enjoy it. I wonder if the time spent making this custom save state could have been put toward adding an option to remove the info that's always at the bottom of the screen instead. Yes it did. I'm not sure whether the writer is unaware of that fact or is trying to spin this obvious thing as a new feature, but it's silly regardless. @RupeeClock It would be a ROM hack if there was an illegal hacker involved. This is their property, so the term "hack" is irrelevant. Nice adjustment for the weak. Now wheres my Zelda 2? Edit: Just tried it. Its pretty much a suspend point where they’ve done most of the work for you before the first dungeon... Garbage. A google search would show most kids how to do that. nice! Nintendo if you do more things like this you will keep (some) people happier! so instead of adding a DIFFERENT fourth game......they take out the "Second Quest" from the original and moddify another copy for slackers ??? I mean, the original was not difficult, my 8 year old brother was tearing through that game with no problem, but the fun wasn't in the difficulty (or lack thereof), it was the exploration and free-wheeling, which is now taken away ??? "It's Dangerous to Leave Her Alone, Take Her !!!" @Cosats INFORMAL; an act of computer hacking. -a piece of computer code providing a quick or inelegant solution to a particular problem. "this hack doesn't work on machines that have a firewall"
-a strategy or technique for managing one's time or activities more efficiently. "there's one easy hack to avoid the eight dollar popcorn trap: eat before you get to the theater"
@Cosats It happens, Nintendo have sold NES roms taken from rom sites as evident from iNes headers, as part of their Virtual Console releases. Why would someone want to do the second quest if they're already cheating in the first to make it easier? That makes no sense. Not to mention if you want to do the second quest at any time just name the file Zelda and you start on the second quest. I hate surprises and I hate Nintendo games. I signed up for three NES games a month, and if Nintendo wants to continue to break their promise on delivering three games a month, well, I’ll be left with no choice but to tell the internet just how mad this makes me. They should've added an in-game map. We'd be in luxury with the game if we simply had that. Pretty cool. Interested to see what else they'll add over the coming months. Funny enough I beat the game for the first time just last week. I dunno if I like this honestly, but I guess it's fun to play around with? Wow. By reading some of the really angry comments here, you'd think Nintendo was coming to kill your family instead of offering an unexpected (to many) novelty alternate version. I personally think it's a pretty neat option, but one that can easily be ignored if you don't and not taken as a personal insult. @PlayedNSlayed it $20. You spent that coming up with this complaint. Congratulations. @flapjack-ashley they're so angry! And come here to say they support Nintendo, by passive aggressively yelling at them. I don't get it. @flapjack-ashley @bimmy-lee Those are probably my favorite comments in here. @flapjack-ashley I think you're overselling the "anger" people have toward this. This is a neat surprise, Never beaten second quest maybe I'll attempt it with this version. Not sure I'm for this personally. But that's just me. The best part of the game is getting upgrades and items. Kind of defeats the purpose if you have these items going in for veterans of the game . Sounds like an assist mode for newcomers which I think can be great for them. Not gonna lie, I hope there's this type of special game release for metroid. I'll definitely need help on that one. They announced a special edition of Zelda was coming, but it sneak-releasing today was certainly a surprise. I’ll check it out if I can ever manage to put Super Dodge Ball down. @BraveBiT ooooooh I’d love NES / SNES remix on switch.. I forgot about those remix games! @HobbitGamer - I’m just giddy to finally see some items and dungeons I’ve never found. 32 years, and it remains the lone LOZ console game I haven’t completed. Not like this counts as completing it, but it’ll be fun to mess around with this version. @Dpullam Do yourself a favour, friend. It's a beautiful game. I have no issues with an easier version of the game, but it seems like the perks here destroy the point of the game to begin with. Didn't see that one coming. Whenever I pop in Zelda, this is pretty much the load out I aim for before heading into the first dungeon. @TheDragonDAFan You must have missed the comments by JHewitt and Retron earlier. Obviously many are just indifferent, but some are just way over the top. @bimmy-lee I know what you mean. I think it’s cool to have the option to just play around with. @flapjack-ashley your comments are WAY more hyperbole and over the top than the examples you cite. So, basically the Game Genie version of the game? Got it! The Legend of Zelda: Easy Mode. On a serious note, it's great that they're making this classic a little more accessible to casual and/or inexperienced gamers. I might try it out myself at some point, though I think overall I prefer the original. This is what I've always wanted from Nintendo? This is a really cool development they're willing to release specialty modified versions of old games. That's unexpected....this perhaps can be the unique hook that makes NESFlix interesting....unique game modes that didn't exist on prior consoles. Who says Nintendo has few exclusives this year. TLoZ Digital Deluxe Edition with DAY ONE DLC Pack (Bonus items: White sword, power bracelet, 3000 rupee starter pak) launched today! @pika677 Thats right! Its quite funny when you consider Nintendo's failed legal action against Codemaster's device in the 90s... that similar 'cheats' are now sold as a special feature by Nintendo themselves. Why? I replayed zelda when it was released last month and finished it in a few days of on and off play time. Beat it quite a few times in the old NES days so it brought back memories and I tended to remember where everything was at from decades ago. Its not really that hard of a game. Now this came out of nowhere. The timing behind this is also perfect, as I was just done talking about how we could get our money's worth. If what @subpopz and @NEStalgia summed up best as "NESflix" is starting to put some original content in the rerun library (well, I had to complete the Netflix metaphor somehow), we might sing a different tune in a few months (or weeks, hopefully). I have no problem with it one way or another. Some will like it. Some will want to explore/level up. I can see it as a way to more easily explore the world, but it does seem to take some of the fun out of the whole adventure. My only issue with the game so far is that the controls are a bit fiddly when using the joy-cons. I've not moved several times because the controller registered a diagonal instead of UDLR. Didn't think that would be an issue, but it makes a difference when you're trying to attack orthogonally and the character doesn't respond. @the4seer You definitely have the right idea. That is how I choose to look at things like this myself. Zelda. The "nancy edition". When you just don't have what it takes. What they need to do is release the BoTW Zelda demo done in the NES style. Now THAT would get a lot of attention. I still waiting for Metroid and TwinBee. One version for old school gamers, one for today’s gamer. As a 5th grader, my bud and I spent hours hand drawing out entire overworld map and marking stuff in order to beat this. Today’s gamers have wiki and easy modes like this to help them. Our map was like 20 pieces of paper taped together too. Just type Zelda and you get the second quest. I can get to level nine without a sword. I thought it would be a third quest darn. As someone who’s beaten Zelda dozens of times through the decades, including in its original release in the 80s, I’m not really sure I see the point. You’ll breeze through the game and basically miss a lot of what makes this game great (exploration & discovery, the sense of reward in powering up), even 3 decades after its original release. I’ll never forget my 6th grade year using my friend’s hand drawn maps and word of mouth tips to complete this game. There was no internet, magazines were few and far between...it truly was up to you, your buddies and maybe the game counselors on the Nintendo hotline if you really got stuck. This mode is like the total opposite of that. If you’ve never played it, I would highly recommend the original mode first, as the OG Zelda remains a great game. Hey....least your kids no matter the age can say they beat a Zelda game. Nintendo putting out romhacks now? What is the world coming to? I'm not so interested in this, but it's a great sign of things to come. Gonna be fun to see what they come up with. @Agent721 it's the principal smart arse or don't people have those anymore? Nintendo have charged again for 30 year old games that you don't even get to own anymore. The point is they've had almost 2 years to get this 'service' out and the best they can do is NES games and cloud saves. Why should they care about getting decent games on the Switch for the rest of this year,especially third party games,when they can just fob everyone off with crap like this and people like yourself continue let them off the hook as though they should be above any criticism for it. @gortsi does it make you feel better to insult people? Is it fun to further drag the level of discourse into the swamp? K while I've been on-board with Switch Online from the beginning, they should've mentioned this earlier. What the h*ck that's awesome. Better third party games is a different problem that has nothing to do with the pricing and value of Nintendo online. My answer to that, along with well over 50% of gamers in the US, is to own multiple platforms. I own them all and I’ve got no complaints as a results. @gortsi no that's how things get worse. Everyone justifies their bad behavior with "well they deserve it". That doesn't make things better it just makes them worse. @Agent721 it's not so much of a bargain when for $0 you can get cloud saves, voice and text chat, free games, and more. @Yorumi no bad behaviour on my part, I just corrected his spelling and indicated his age. It's no my problem that this dude is constantly moaning about a buck and a half a month. And yeah it's not a bargain if you have a PC, we all know that. I have a PC but I'm not playing games on it just like a lot of other people that own PC's or laptops. That's not a legitimate argument. @Medic_alert It is if you don't even know where the first dungeon is and you go wandering off in some random direction. @gortsi no you were being insulting and dragging things down. If you truly believe someone is a "troll" then take the advice of don't feed the trolls. I'd rather see the Snes BS game with the extra quests. Microsoft: 100+ games AND the best of Rare. We didn't start out like this, but hey - better late than never! Sony: Pffft, amateurs. ALL Playstation games are playable on PS4 out of the box. You're welcome, Internet. Nintendo: Forget Virtual Console... we have NES games! And easier versions of said games! HYPE HYPE HYPE! @impurekind that's why you should download the map online. It's not cheating it used to come with the game. @MarioFan02 what? There are 550ish back compatible games on X1. There is no backwards compatibility on playstation. Really? Weren't all PS3 games compatible at launch? Sony made a big deal about playing pre-owned titles and whatnot. @MarioFan02 not a single PS3 game works on ps4. If you want to play PS3 games you can stream them but not download them. No PS3, PS2 or PS1 discs work on PS4. Some vita titles do have cross play. The Xbox has 360 games that play the same as 360 and og Xbox games that play as on the original box. They also have up-res'd versions of games from both so 4k red dead can only be played on Xbox one for instance! Second Quest was in the original game. Have you people even played Nintendo before? So basically Zelda the Easy Version? Hmm... still kinda cool. I've beaten the game before, so I wouldn't mind checking this out just for the novelty of it. This would be so much more appreciated with Zelda 2, though. Speaking of which... Zelda 2, please. Gief. @Yorumi Thanks for calling that guy out and not stooping to his level. I have to agree with what a few others have said here. This kind of defeats the purpose of the game which is to explore and discover items. I guess it's good for people wanting an easy mode. I was hoping that they would improve the controls, which is my only complaint about what is otherwise an excellent game that still holds up. Simultaneously both surprising and underwhelming. Imagine if Mike Tyson's Pumch Out gets a similar treatment... To this day I can't forget what an intense but fun challenge that game was to 13yr old me. Tyson had an invincible aura at the time, and in the game, too, those first few matches. @SmaggTheSmug my thoughts exactly. Unlocking new items and finding secrets is my favorite part of the original Legend of Zelda. I’ve played it through about 10 times since I was a kid to find the most efficient way of doing this. Call me when they release The Legend of Zelda: The Third Quest (otherwise known as BS The Legend of Zelda), bonus points if they include the re-record the voiceover tracks. @the4seer because according to the people, who have tested this out, this is a simple save state. That's pure laziness on Nintendo's part. Also, let people complain if they want to. "Of course, some people in the comments have to kiss Ninty's bottom by complaining about other commenters, no matter what", could also be used as a counterargument. @SmaggTheSmug it's probably intended for people who already know the game very well, but just want to have some more fun with it. I'm not even mad. That's a pretty good way of making an incredibly difficult game more accessible to the curious newcomer. Pure laziness, as opposed to not having anything at all. Uh ... Yeah... That doesn't make any sense. Sounds more like "pure entitlement", to me. As for kissing up to Nintendo. I actually never mentioned Nintendo, in my comment. I mentioned that fan service should be embraced. On any level, large or small, it exist only for the player. If you don't like it then don't play it. Calling it "lazy", as if you were promised something more, sounds entitled. All in my opinion, of course. Seriously though, this isn't a huge addition to the library, but it's promising. If we ended up with remixed versions of Mario 3 and Metroid I'd be thrilled. Or a version of Kid Icarus that doesn't feel like driving a snowblow while drunk. Oh okay. Kinda like Kid Icarus' second playthrough? Tbh, I'm a wee bit disappointed. I thought we were getting the BS Zelda game. Or some other country exclusive game. Not that much of a novelty, considering you could probably do the same thing with a game genie back in the day. I dunno, I never used it on my Zeldas. @Kamalen It's not a difficult game. Todays players can find secrets without being handed everything on a silver platter, especially since most of the dungeons aren't big or confusing. Because that's how you get most of your items in Zelda games. Barring the weirdness of Worlds rent-to-buy system and Breaths, we don't need no stinkin traditional dungeons! @Tempestryke It is a way harder game, because 1) it was made in another era, when games just get out of arcade and were designed that way and 2) because of old controls that feel very different to what we are used to now. @jhewitt3476 When I speak about controls, that is not only about buttons, but the control design of Link as well. See difference with the (real) 2nd game : A Link to the Past. There, Link can move all 8 directions and the sword do a 180° swing. Those simple things makes combat massively more forgiving. That, and you add some stuff like no world map, no guidance on how to find dungeons, and you do have a difficult game because of its old age. I have no doubt the controls are understandable for a 7 years old, but will he/she be able to complete the whole without a guide or help ? I fully did LoZ 1 some years ago in a emulator, with many deaths and using emulator save stats to pause and resume, while I usually surf on ALTTP without much harm. What? Zelda isn't an arcade game. If players can roam around bigger and more complex, open-world games then little old Zelda 1, then they can beat Zelda 1. The controls are up, down, left, right B, A, Start. Are you saying that walking around a screen using the d-pad and 2 buttons to stab, shoot and magic things to death is...too difficult for people? Dunno how anyone manages with other top down Zeldas, or Pokemon? Must be excruciating for today's gamers to play.